Greater density for the inner city comes with implications for open space. Much of the space is designed for passive use and active uses are confined to walking and riding a bike. Glenn Burge asks where will the children and those that live in these new communities play. 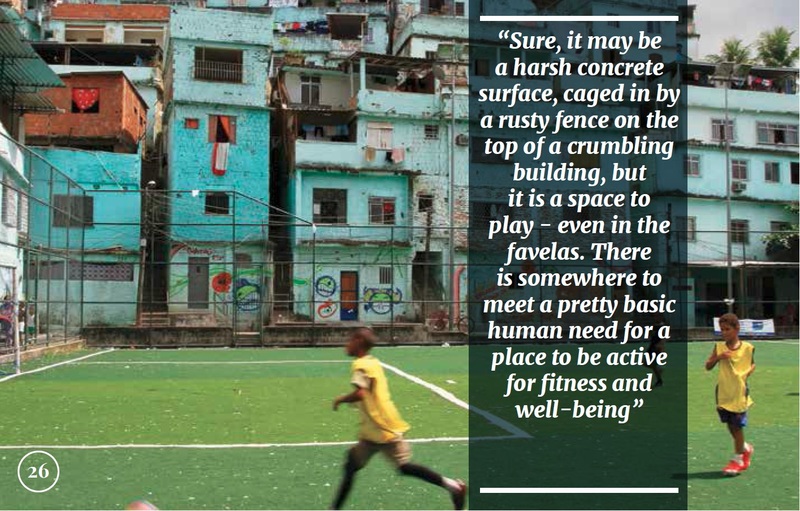 In the slums of Rio de Janerio there were spaces to play created for children to kick or throw a ball around. Somewhere to meet and laugh, make friends, and breathe harder through the smog to get fit. Sure, it may be a harsh concrete surface, caged in by a rusty fence on the top of a crumbling building, but it is a space to play – even in the favelas. There is somewhere to meet a pretty basic human need for a place to be active for fitness and well-being. Now compare that to the future we face living in the City of Sydney. Dozens of cranes are adding the next 60-80 metres high towers of two and three bedroom apartments from Ultimo-Pyrmont through to Green Square. Soon the 60 hectares of the prized Bays Precinct, and then the huge Central to Eveleigh project. Sadly, when it comes to making sure the next 100,000 or so new residents have guaranteed new sporting fields and facilities, the line about a great place to live currently rings hollow. The failure to guarantee new sporting facilities as a fundamental principle of the major new housing projects in the City of Sydney catchment is an extraordinary failure of leadership at both the political and planning levels from Council, the State Government and its development agencies. We are currently seeing an outcry by Pyrmont-Ultimo residents over the failure 20 years ago to make sure there was a school site planned for the future population. In the next ten years we are likely to see a greater outcry over planners ignoring a basic human need of adequate recreational facilities. There are thousands of pages of academic research on the importance of active recreational sport creating social capital – through to the irrefutable health studies of how exercise is critical to well-being. Thousands of words are devoted each year to how children are unfit compared to previous generations and the blow-out in health budgets, due to heart disease and other illness, linked to a lack of exercise from childhood onwards. Or this finding: “Participation in sport and active recreation is seen as a way to improve personal well-being and a forum for the creation of social capital by creating structures with the community that help strengthen social connectivity and resilience.” (Australian Sports Commission). And another: “It is estimated that 60% of all children aged 5 to 14 years participated in at least one organised sporting activity outside school hours”. (Children’s Participation in Cultural and Leisure Activities, Australia, Australian Bureau of Statistics). For every 10,000 new residents in the new apartments, at least 40 per cent will want sporting facilities. With a younger demographic coming into apartments the figure is much higher based on the analysis by age brackets. So why such a fundamental planning failure in the City of Sydney? Across the rest of Sydney and in other cities, there are thousands of parents involved in sporting clubs – the mums and dads career politicians usually fear – holding Councillors to account. But here is the catch for the City of Sydney. There are virtually no SPORTING clubs: the clubs cannot form as they are told there are no facilities. And with no clubs, there is no organised and effective way for thousands of parents to get together and force the outcome. City of Sydney’s past 20 years is littered with examples of the failure to provide new fields and other basic human infrastructure needs – to ensure a healthy and vibrant community. At Harold Park, despite City of Sydney’s own 2008 Stratcorp Recreational Needs Study admitting a facilities shortfall, another 2,000-plus new residents have no new facilities. The signature 1990s renewal project at Ultimo-Pyrmont hadn’t even a cursory attempt to meet the future needs of the population: witness the fiasco of the Ultimo school development, where the State Government finally admitted last December that it needed a school for 1,000 students. Why wasn’t this a part of the original 1990s plans for the area? Or Green Square. There will be at least 53,000 new residents. That is about the size of Leichhardt Municipality, which is still short of fields despite 10-12 fields for current residents including Leichhardt Oval. For the City of Sydney, it has been easy so far to kick the problem of a lack of facilities across the borders to Councils elsewhere. Those children and adults that have no grounds or clubs head off to play in other Municipalities. But for how long? Schools are zoned by post codes and give preference to people from in the area if there are more people than places. What happens to out of area kids in the future when clubs pressure local councils to cater first up for their own residents? By the time the huge re-development projects across the city are completed in the next 10 to 20 years there will thousands of extra children looking for somewhere to play. If you have any doubt, go and read all the UrbanGrowth glossy documents on the Central to Eveleigh project. You will find not one word of active recreational facilities mentioned. The reason why active recreational space is ignored is very simple. There is not a requirement that new major developments must make provisions for new sporting facilities in the developments to reflect the usual participation rates for new residents. Don’t expect the property developers, or the conga line of urban planners, environmental planners, and architects that control the narrative around “Better Cities” to demand active open space. For the Meriton and Mirvacs of the property world, in their minds, every hectare of land is valuable to squeeze in the apartment towers. They will never demand sporting facilities. So, supported by compliant urban planners and architects, both private and in government, and planning academics, there has been a narrative accepted that open space only means cycle-ways, pocket parks and walkways. Basically passive, not active space. Often it is the State Opposition Party that shows leadership. But unfortunately, Leader Luke Foley showed a lack of courage (or as Paul Keating might say “ticker”) by directing his Labor candidates last election not to support the Spaces to Play campaign request for a minimum of seven new sporting fields in the Bays Precinct. Most people at least acknowledge (though many disagree with) the economic arguments around urban renewal and higher population in the inner-city. But government at all levels is refusing to accept they are failing future generations of apartment dwellers by ignoring the economic and budget benefits of healthier residents by providing new sporting facilities for them. Glenn Burge is convenor of the Spaces to Play campaign (www.spacestoplay.com.au) and infrastructure advocate for Canterbury District Football Soccer Association (whose eastern boundary is George Street). Glenn was until recently president of Balmain DFC, the second largest football club in NSW with 2,380 members.